It registered 33 militant attacks during the day. Pro-Russian separatists continued to fire on Ukrainian army strongpoints in the antiterrorist operation (ATO) area with arms banned by the Minsk agreements. By early evening the ATO HQ has registered 33 shooting attacks, it said on Facebook. 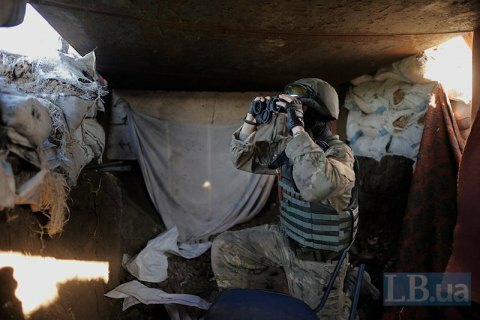 In the Donetsk sector, militants fired on ATO strongpoints near Luhanske, Mayorsk, Avdiyivka, Opytne and Novhorodske. Zaytseve was a hot spot where they fired 158 rounds from 120-mm and 82-mm mortars. They also pounded Avdiyivka with mortars, automatic grenade launchers and small arms. However, according to the HQ, the Ukrainian did not return fire from high-calibre weapons. "Our servicemen were able to hold their positions, using small arms, grenade launchers and heavy machine guns," it said. In the Luhansk sector, militants stepped up their activity. A sniper was operating in the area of Shchastya, heavy machine guns were used in Novozvanivka. A similar pattern was observed near Shyrokyne in the Mariupol sector. "The intensity and pattern of the shooting shows that militants are planning to keep our servicemen on alert along the entire line of contact," the HQ said. As reported earlier, on 28 March, the situation in the ATO area escalated. The ATO HQ registered 72 shooting attacks, or twice as many as on the previous day. Six Ukrainian servicemen were wounded yesterday.